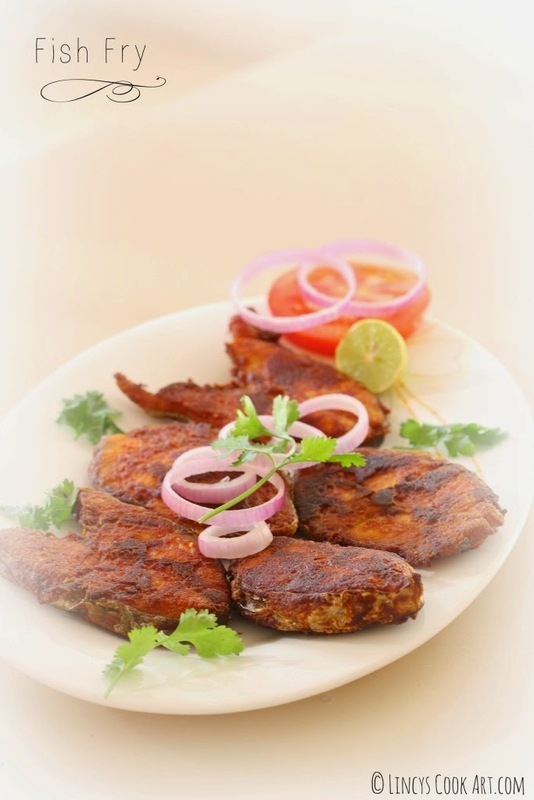 Fish fry is a mostly ordered fish item in restaurants and even demanded at home. The difference between home cooked fish and the restaurant ones are the crispiness and the shape. The restaurant fried fish are crispy and the crispness stays long if you keep as such in room temperature. Another difference if we fry fish at home it tend to break while frying sometimes while turning side. Both issues could be solved by following this restaurant style fish fry. So easy to make and crispy and also tasty. The crispness stays for about 1 hour or even more after frying the fish. So we can fry and keep the fish before the guest arrival. In a plate keep the cleaned fish fillets and the items to marinate the fish(Turmeric powder, red chilli powder, ginger garlic paste, corn flour, lemon juice, a teaspoon of oil and salt). Sprinkle little water and mix well to make as a thick paste. Rub the marinade over the fish fillets and allow to marinate for about 15- 30 minutes. Heat 2 tablespoons of oil on a flat frying pan add shallow fry the fish in batches. Flip the side and cook the other side too till crispy. Once it get cooked drain from oil and keep on a kitchen towel to absorb excess oil. Serve with hot plain rice and spicy rasam. Notes:You could replace Kashmiri chilli powder with normal chilli powder and add a pinch of red food colour. You could add half a teaspoon of pepper powder to make the fish fry more spicy.